If I had to pick one type of food to eat for the rest of my life it would be Italian. I can’t get enough of it. My pasta portion sizes are about the same size of my head (which is quite large). It is my go-to for any day of the week. 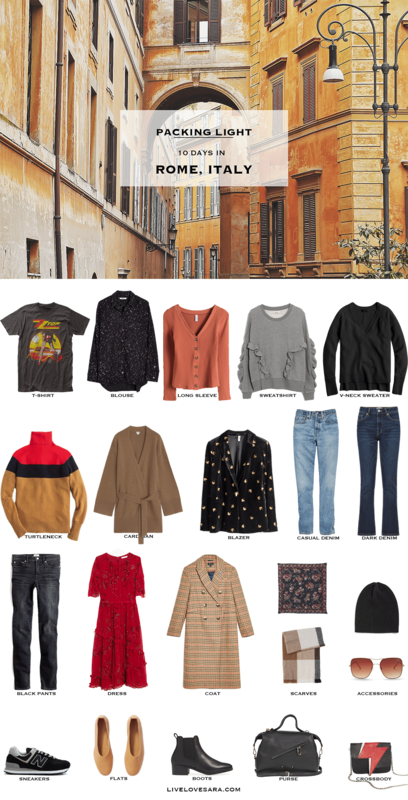 And with that introduction I have a packing list for Rome in December. They say the best season to travel there is between October and April, because except for the week of Christmas, it’s low season, so no crowds, cheaper hotels, and there are no lines. The temperatures average around 10°C with a chance for warmer spring like temperatures, and drops to cooler temps at night. The crowds pick up over Christmas and the Christmas decorations are supposed to be lovely. Many restaurants still have their patios open with little heaters to keep you warm though, and it will easier to get in to some of the hard to get in to restaurants that usually need reservations months in advance. As for clothes, stick to pieces that layer well because the temperature can fluctuate throughout the day. Scarves for the wind, as well as a knit hat when the colder nights come. Just like many other European cities, Rome has a lot of cobblestone streets, so comfortable shoes are a must. What is the one thing you could eat for the rest of your life? *This packing list would work for many seasons and destinations as well.